Fronted by former Expanding man guitarist Dave Wanamaker, New York-by-way-of-Boston outfit Loveless deliver an astonishing debut with Gift to the World, an aptly titled collection of undeniably rocking power-pop. 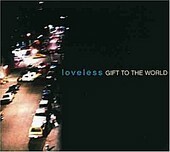 From the opening charge of "Go", through the glorious, hook-laden, mid-tempo radio-ready hit of "You Wore Me Out", Loveless covers a lot of pop ground - and always comes out with a gem. If you listen to "Beautiful", you can just imagine cruising down the road, windows down, the warm air blowing on your face, while this song blasts off the modern rock radio station - as well as the cross over stations. Here is a song that has the thump and power to make both rocker and power-pop fans rejoice, but is also catchy and warm enough that even your parents and the un-hip kids at school would embrace. "Beautiful"'s chorus is one of the standout ones on the album, proclaiming, "Tonight, I only want to feel beautiful", an upbeat statement that injects even the most unconfident person with a moment of self appreciation. And even though "Beautiful"'s chorus is one of the standout ones on this album, it isn't the exception to the rule. That is the beauty of Gift to the World. Every song, whether it is "Stick to the Girl", a blazing-guitar, roaring rocker, or "Darling Would You", an emotional, teary-eyed, almost industrial-pop song, contains memorable choruses that propel the verses to the next level. Loveless writes good, solid, catchy songs, but they are an exceptional chorus band. Their choruses are like no other, the glue that holds the songs together, and the reel that pulls you in, even when you think you've lost interest (which isn't often). Regardless of what you look for in music - lyrics, melody, rhythms - the band excels beyond most rock bands in combining these and delivering a glossy package that is well-produced, radio-ready, and still good after many listens. I'll give it an A-.